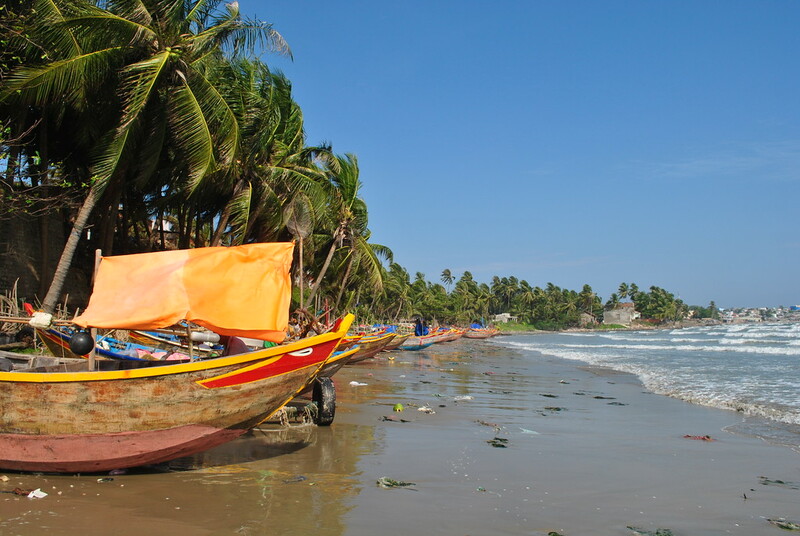 Mui Ne Beach & The Fairy Springs Of Vietnam! Moving further down the coast of Vietnam from charming Hoi An and Nha Trang, we arrived in Mui Ne beach unsure quite what to expect from the place. Billed as a kite surfing/wind surfing/anything to do with wind mecca, we were intrigued to see what it was like. Our first mistake was to think we could walk from the bus station to the guesthouse, big mistake. What followed was a 45 minute walk with our backpacks on in searing heat, along a seemingly abandoned/unfinished coastline with huge waves and winds constantly wipping against the sea wall. Get a taxi from the bus station, it wasn’t the best start to our Mui Ne experience! 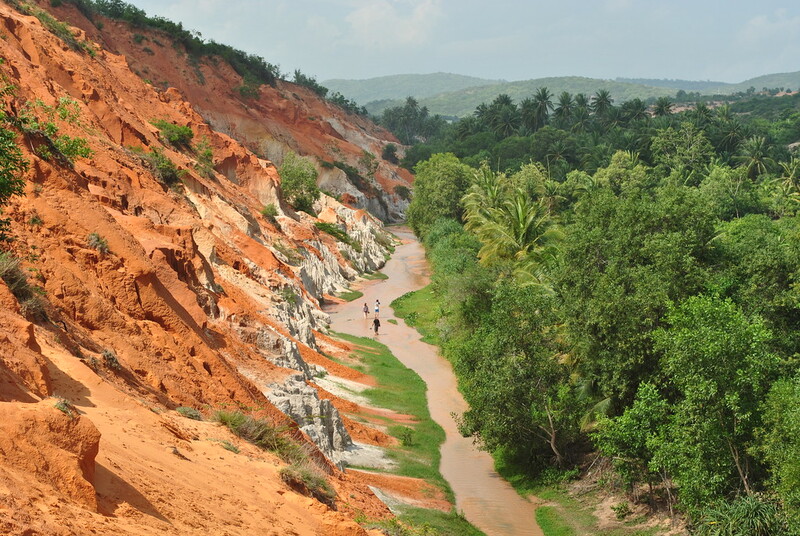 Despite not being wind surfers, there were plenty of things for us to do in Mui Ne, and in our brief two day visit we embarked on a tour by jeep to the fairy springs at the red canyon, and took a slow walk along the spring admiring the amazingly coloured canyon. 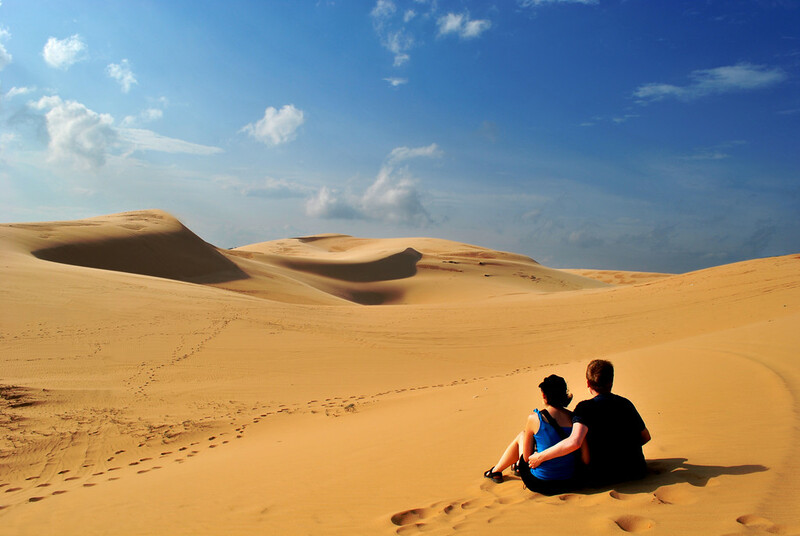 We also took a trip to the local sand dunes, and whilst we loved the yellow sand dunes, the red sand dunes just off the road were very disappointing and we would skip the red ones if we were recommending things to do in Mui Ne! These sand dunes were far more relaxing than the time we went sand dune surfing in Peru! We also visited the old fishing port of Doi Cat Trang and spent a short time there. We were still tired from our Sapa trekking experience, so two days was more than enough time to for us to see the main sights of Mui Ne. Unless you’re into kite surfing you may struggle for things to do after a couple of days! Looking for more Vietnam Inspiration? Check out more articles here.